It can be hard to help your child learn to read. We may have learnt to read differently to the way our children are being taught or have learnt English as an additional language. Phonics teaches children to read by matching sounds (phonemes) to letters (graphemes) or groups of letters. Here are some of the words and phrases you may hear from your child and what they mean! Phoneme- the individual unit of sound in a word. The English language contains 44 different sounds. Grapheme- the letter or group of letters that visually represents the phoneme (sound). Blending: merging the individual sounds (phonemes) to say a word. For example: c-a-t, cat or th-i-n, thin. Segmenting- the skill of recognising the individual sounds (phonemes) needed to spell and write a word. De-code- work out and read a word. High Frequency Words- words which occur most often in English some of which cannot be sounded out phonically. Your child will learn these in sequence and you may see them abbreviated as HFW or called ‘tricky’ or ‘key’ words. Punctuation- full stops, commas, speech marks, apostrophes, question marks and exclamation marks. 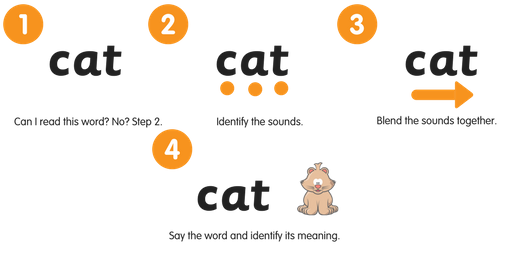 As your child gets better at de-coding words they will begin to recognise and use punctuation mark clues in their reading. Reading is the ability to look at written symbols and understand their meaning. Children who are ‘learning to read’ gain the skills to recognise the symbols (graphemes), de-code unfamiliar words and remember those learnt before. Once your child has mastered this they will begin to develop their understanding (comprehension) and be ‘reading to learn’.